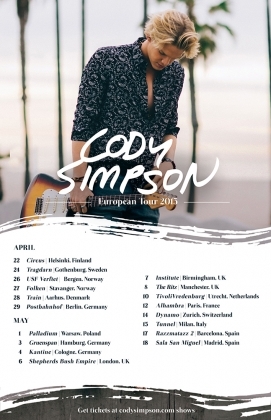 Australian songwriter Cody Simpson will offer two shows back in Spain next month. First in Barcelona on May 17, Sala Razzmatazz, and second will be in Madrid on May 18, Sala San Miguel. With a more mature sound and recovering the best surfer sounds on his new work, the show appears to be a good chance for having a really great time. So don't let this opportunity pass and get your tickets now! Music has played an integral part in Cody’s life since he was a child. He began posting YouTube videos of himself performing his original songs alongside stellar covers by some of his favorite artists racking up millions of views.